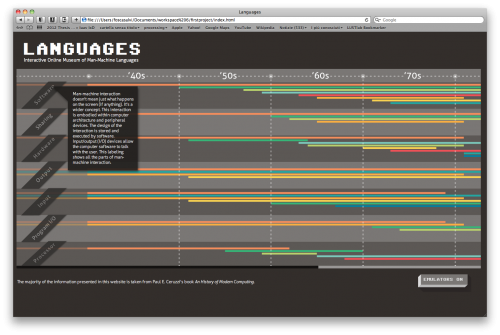 Languages is an online platform which tells the history of computing from the 1940s to today. It is a web app, an ordinary website but with the qualities of an application. Languages is addressed to relatively young people who haven’t lived in first person the history of computing and perhaps never had any interest in it. Languages “talks” simply, and is based on the usage routines of the machines analysed. 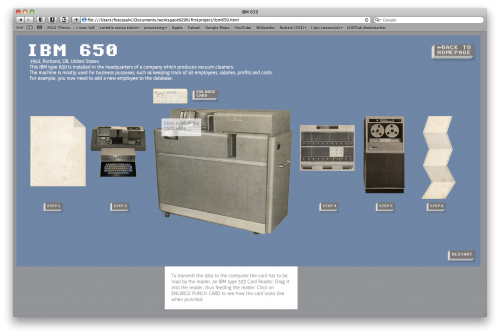 This history is not explained through the technical characteristics of these machines—which would appear too complex and incomprehensible to those not used to “crunch” technology— but uses demonstrations of what it was like to use these machines. The goal is to mix a traditional way of consulting the provided information —i.e. purely encyclopedic and theoretical—with a more practical one. To achieve this goal I chose to build the website based on two principal elements: the timeline and the emulators. The timeline is the first thing the user meets when he or she accesses the website. It is of course a temporal scale which along its length gathers facts about the computing world between the 1940s and the 2000s. The different items are divided into more specific categories, such as “input” and “output”, then analyzed through their presence in the computing scene. The timeline is interactive: it can be interrrogated by the user, who can choose which information level he wants to reach, since the information is available in different modes and layers. The emulators—the second step with which users interact with the website—can be reached from the initial timeline. These are not the kind of emulators common in the computing field, but are wider views of the interaction with the analyzed machine. The emulator could include and represent all the parts—even the hardware—of a computer, and presents an example of the usage of that computer; this will highlight the most important aspects of the experience, not necessarily the more technical ones. Languages includes five emulators which represent five computers spread over the time period analyzed.